Spotlight - Blu-ray Review - ReDVDit! 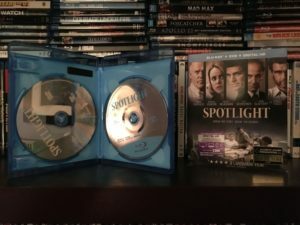 Spotlight was released on Blu-ray just before the 2016 Oscars, and was one of the only Best Picture nominees from the “Oscar Season” to hit home media before the show. Thankfully for home viewers, it won, and so we do not have to wait a few more months to see the Best Picture winner for 2016. I first saw Spotlight just a few days before the Oscars, and after completion, I immediately pegged it as my “Best Picture” choice. In fact, I play in an “Oscar Selection” betting pool every year where we predict all of our winners and compete for a prize, and choosing Spotlight won me the pool this year, so it holds a special place in my heart (read: wallet). I am also a lifelong resident of the Boston area, so this movie’s story was extremely relevant to me and it hit close to home. 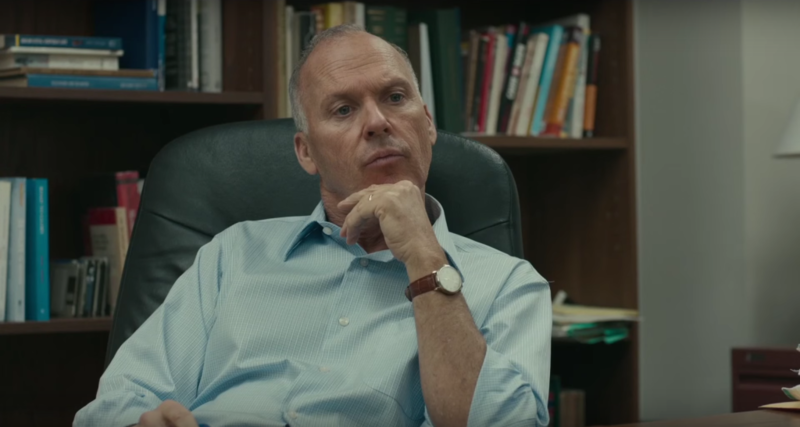 Spotlight has one of the best ensemble casts of recent memory, with Michael Keaton, Mark Ruffalo, Rachel McAdams, and Stanley Tucci all turning in masterful performances. Liev Schreiber also plays a smaller role as the new editor of the Boston Globe, and does a great job as the “outsider” character, not being from Boston like the rest of the team. The entire cast is terrific, and they are by far the best part of this film. One thing of note in every movie centered around Boston is the accents, and I can say, as an expert with a Boston accent myself, that they do not overplay them and they come off just fine. Overplaying the accent is the worst thing an actor can do, and Keaton handles a subtle Bostonian accent just fine. The victims in the story are played by extras from Boston, so they obviously nail the accent, but everyone else is okay. This isn’t a Black Mass situation where the accents are so overdone, which is a win for any Boston-based film. You could give 5 stars on that alone. 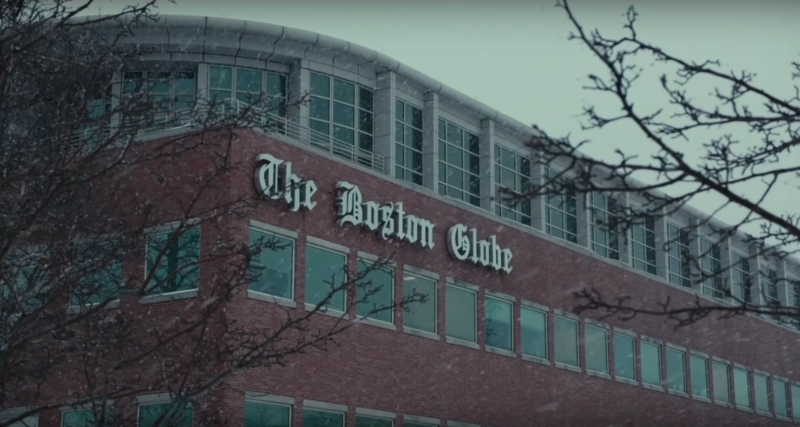 The film follows a team of investigative reporters, members of the “Spotlight” team for the Boston Globe, who are tasked with shining light (pun intended) on the long-standing child sexual abuse incidents in Boston by the Catholic Church. As the team exposes the various priests, teachers, lawyers, bishops and just about everyone else involved in the Church, they soon realize that they are facing a power that is much greater than anything else in the city. Eventually they discover that they are dealing with a scandal that is not just city-wide, or nation-wide, but in fact a system-wide scandal across country borders and oceans. The best scenes in Spotlight come in the tense moments between reporters and church officials. Ruffalo shines in his interactions with the good-guy lawyer who is taking on every abuse case he can, played by Stanley Tucci. 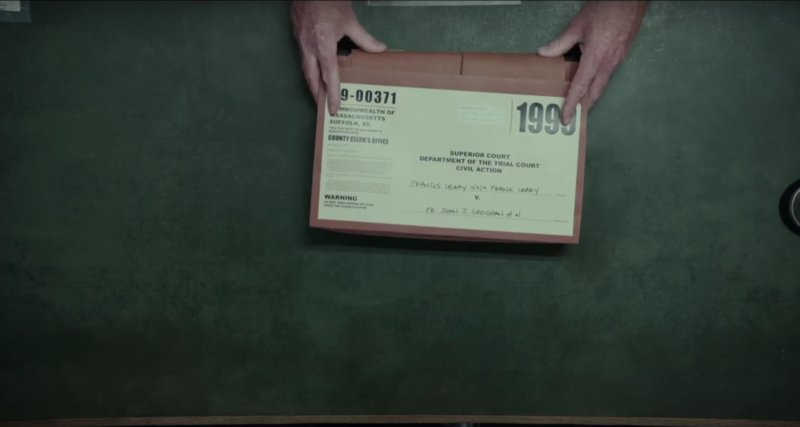 Even though the viewer knows how the story ends in a general sense, you don’t truly understand the entire scope of the disgraceful cover-up efforts by the Catholic Church until you watch the film. I am not Catholic, or religious at all for that matter, but I would never look at the Catholic Church in the same way again after watching this film. It is a story that will leave you emotionally ruined, fired-up, and full of anger. As the end credits roll and hit you with some facts about the scandal, you will be left with the same stomach-churning conclusions that The Big Short leaves the viewer with; these guys are still out there, there is nothing that can be done because they are too powerful, and it is still happening to this day. Spotlight runs just over two hours in length, but it is so well-paced and completely enthralling that you won’t notice the time. I highly recommend watching Spotlight, one of the most worthy “Best Picture” winners in recent years. Spotlight was shot on an Arri Alexa XT camera with a source image of 2.8k and a digital master done in 2k, so the Blu-ray version brought to us by Universal Studios is really a top notch image in terms of Blu-ray disc limitations. Basically, this is not a film that would benefit from the new UHD format. 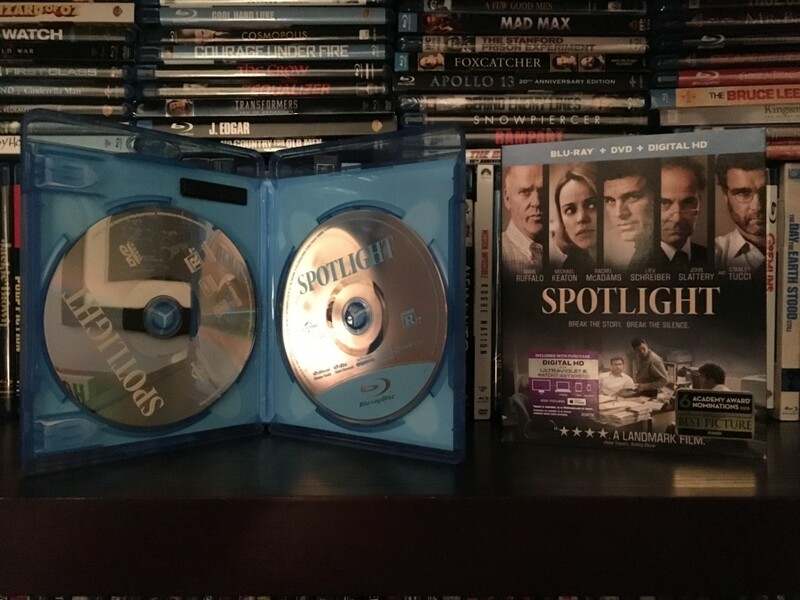 Spotlight does follow in line with many other Universal releases, and delivers excellent picture quality. The image is extremely smooth, and the colors, subdued as they are, come across evenly on the screen. There seems to be a bit of a beige/gray undertone to the film, which may have been an intentional decision by the filmmakers, and the Blu-ray handles this quite well. Spotlight delivers a DTS-HD 5.1 Master Audio lossless track, and it does an excellent job. There really isn’t a whole lot going on in the film audio-wise, but it is a dialogue-driven film and I never felt the need to adjust my volume to hear any pertinent dialogue. Overall, it was a very solid mix, and all of the ambient noise of Boston came across beautifully on my rear speakers. The Boston high-rise offices, restaurants, and churches (including Fenway Park, the only church I attend) all sound great as the background pieces to the larger story. I have absolutely no complaints about the audio for this release. 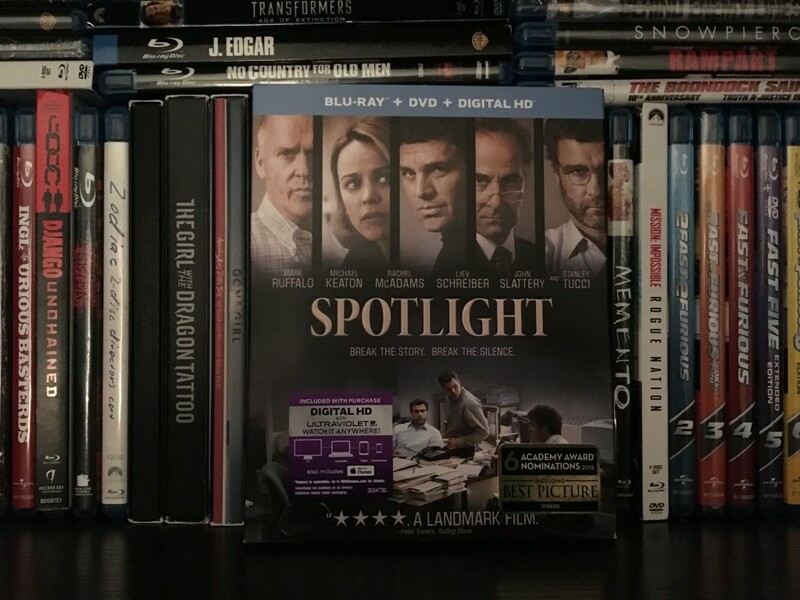 Spotlight struggles with special features, only offering a few short featurettes, all in 1080p on the Blu-ray disc. For a potential (and now winner) Best Picture, this was a bit disappointing. A roundtable with the real Globe reporters, who recall the story and reflect on the film’s events. 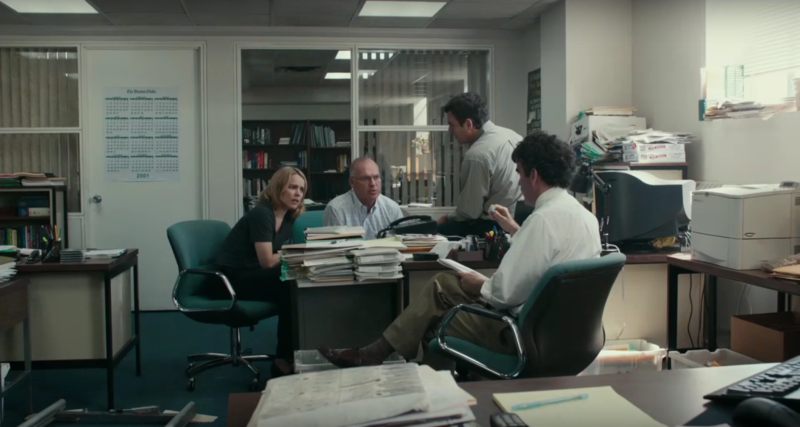 A look at how journalism has evolved since the “Spotlight” story broke. 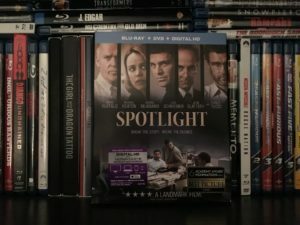 The lack of decent special features keeps Spotlight from a perfect score, but based on the quality of the film itself and the Blu-ray presentation, it is an astounding new release. Spotlight is a highly recommended purchase.